Jorge Saavedra, a 15-year-old boy from Florida, has become the youngest person in the U.S. to escape a murder charge under a controversial “Stand Your Ground” law. A judge ruled that Jorge Saavedra was in danger from the older boy and acted in self-defense when he stabbed 17-year-old Dylan Nuno to death. Jorge Saavedra, who was 14 at the time, stabbed his attacker 12 times with a pocket knife. He had been charged as a juvenile with second-degree murder and faced spending the next seven years in jail if he was convicted. However, a judge ruled Jorge Saavedra was within his right to use deadly force to defend himself. Under the “Stand Your Ground” law people living in Florida are allowed to use deadly force if they fear their life is in danger. The self-defense law was introduced in Florida by Governor Jeb Bush in 2005 and has mostly been used by homeowners protecting themselves from burglars. 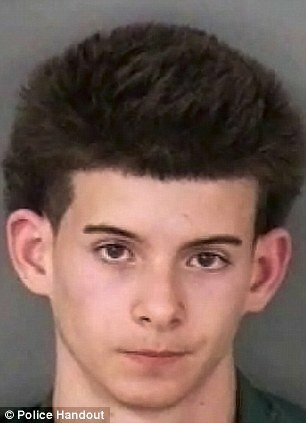 According to legal experts, Jorge Saavedra was the youngest person to escape criminal prosecution under the seven-year-old law. Dylan Nuno’s family criticized Collier County Circuit Judge Lauren Brodie’s decision, calling it “unbelievable and heartbreaking”. “We know this wasn’t the right decision,” said Dylan’s aunt, Adriana Nuno. In a nine-page written judgment Judge Lauren Brodie concluded that Jorge Saavedra was being bullied and had attempted to avoid a fight with the older boy who also attended Palmetto Ridge High in Naples. She said Jorge Saavedra had got off the school bus a few stops before the location where he was expected to fight Dylan Nuno. Witnesses said Jorge Saavedra tried to run away, but ended up fighting with Dylan Nuno and used his knife in the brawl that was witnessed by other students. Dylan Nuno died after being stabbed 12 times in the chest and abdomen. One of the blows pierced the teenager’s heart. In her decision, signed December 30, 2011, Judge Lauren Brodie said Jorge Saavedra had “no duty to retreat” and was “legally entitled to meet force with force, even deadly force”. She stated: “The defendant was in a place where he had a right to be and was not acting unlawfully. A spokesman for the State’s Attorney’s Office said they accepted the decision and would not be appealing. The “Stand Your Ground” law states that an individual has no duty to retreat, no matter where an attack takes place. Under the 2005 law people have the right to use deadly force as long as they “reasonably believe” their life is in danger. Criminal defense lawyer Eddie Suarez, said the law had redefined when you can act in self-defense. Eddie Suarez said: “The statute provides immunity for a citizen who reasonably believes they are in danger of serious bodily injury or death or the commission of forcible felony. Gun control groups criticize the legislation as encouraging citizens to “shoot first, ask questions later”. “Stand Your Ground” law exists in states including Florida, Alabama, Texas, Georgia and Nevada.